Bao. Baozi. Gua bao. Cha siu bao. Siopao. 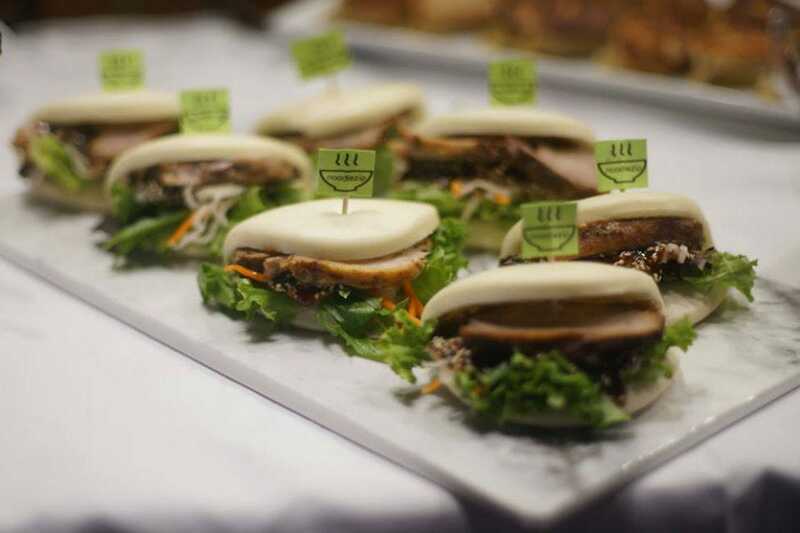 There are many varieties of this popular Asian sammie, including new versions that infuse other cultures into the mix. But all are unified by one thing: a tender, steamy bun. 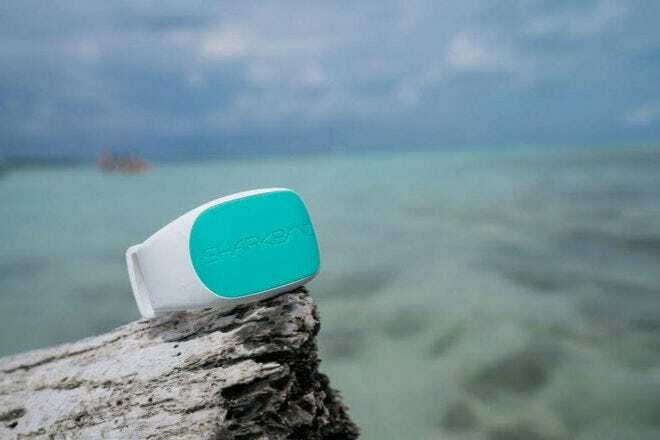 Some have evolved via the Pacific Islands, others through the Yucatan. And if Mexico has a lock on the term "soft taco" for the flour tortilla version, then Asia gets to check the box for "super soft," leading the charge with the tender, marshmallowy wrapper of the gua bao. In 2018, all varieties are hotter than ever. Click on for one fun option per state, and be sure to leave us your local favorites in the comments! 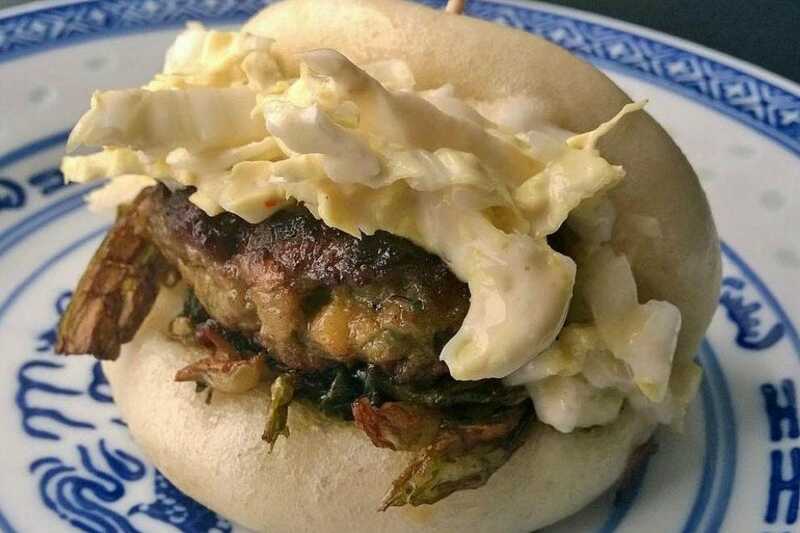 This Orange Beach outpost does its Asian-style buns with some Southern flair. In fact, one of their most Asian offerings – the pork belly – gets a dose of 'Bama (or at the very least, Georgia and Kentucky), as the good chefs here pair it with a peach-bourbon barbecue sauce. 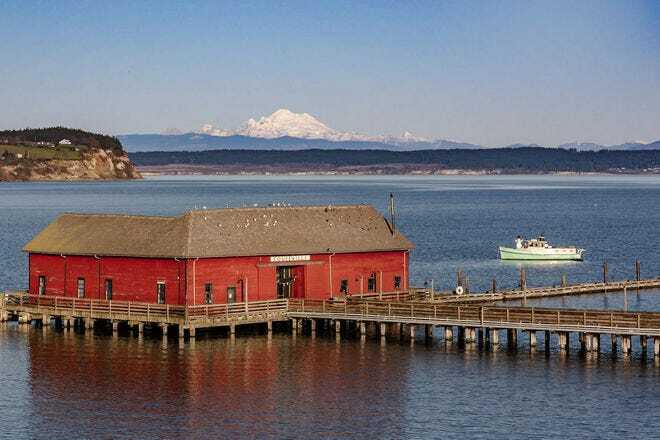 Alaska Dispatch News readers voted this Anchorage venue as the best bakery in 2016, in part because its "dim sum is yum yum!," as one enthusiastic Facebook fan posted. 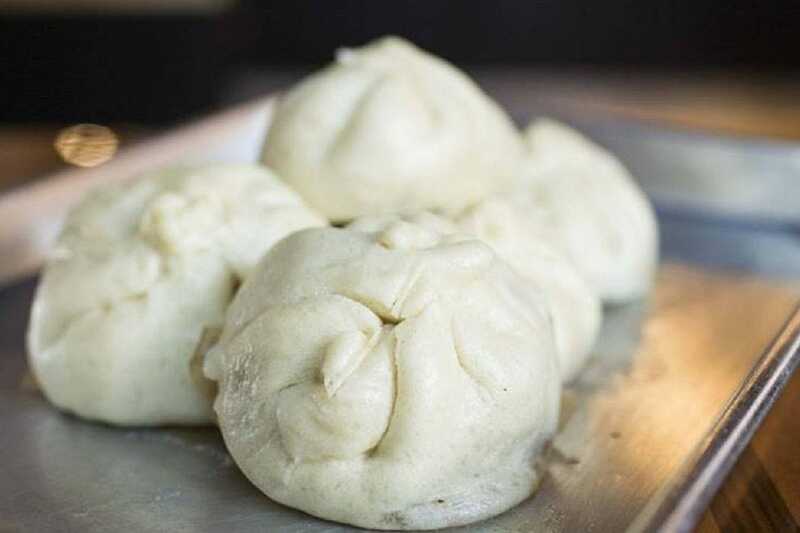 Steamed pork buns are among the lures on their carts and they do a good job keeping residents of America's Last Frontier toasty from the inside out. 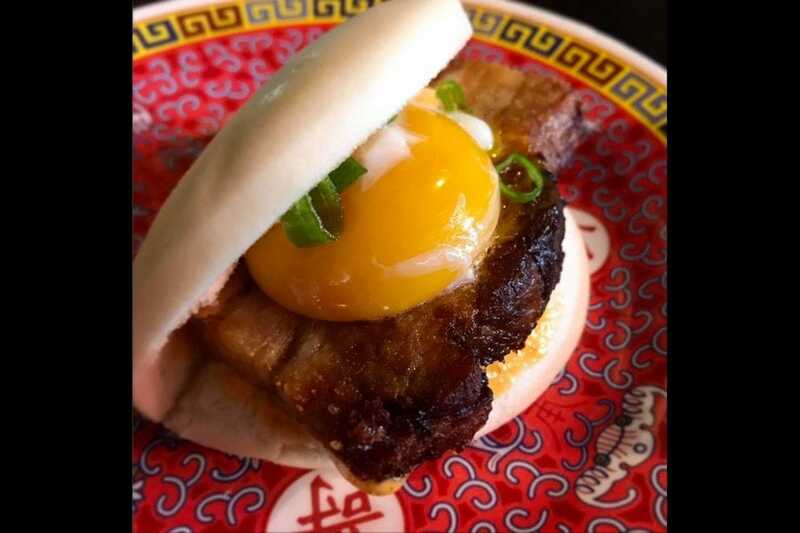 Located inside the Yucca Tap Room, one of Tempe's top venues for live music since 1974, Bao Chow keeps barflies and music lovers sated with surprisingly sophisticated offerings. They include the dashi shiitake bao (Hon-Dashi simmered shiitake mushrooms, pickled red onion, hoisin sauce, daikon, cilantro, roasted peanuts and rock sugar). That's music to our mouths. Bao and buns are highly portable, which is why you'll find a few food truck options on our nationwide roster. 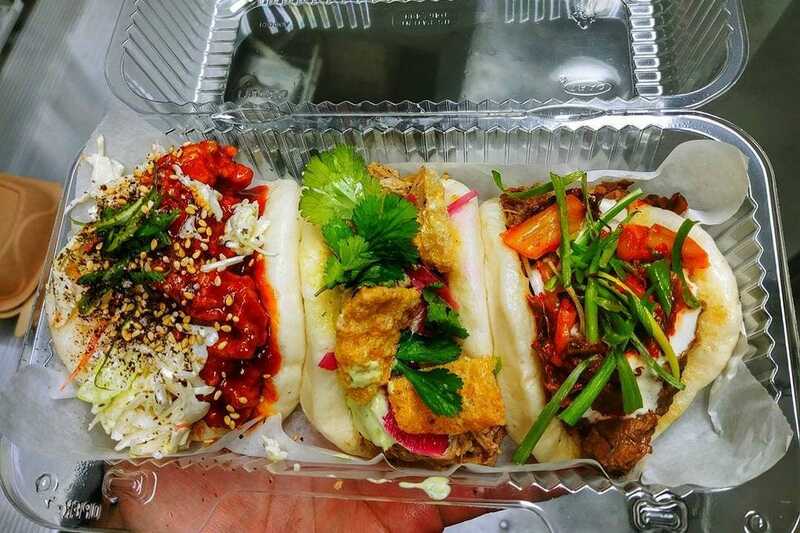 Bentonville's Dough Zone does up a preponderance of Asian-style street fare, including bao and a specialty steamed bun with galbi beef that's topped with pickled veggies. 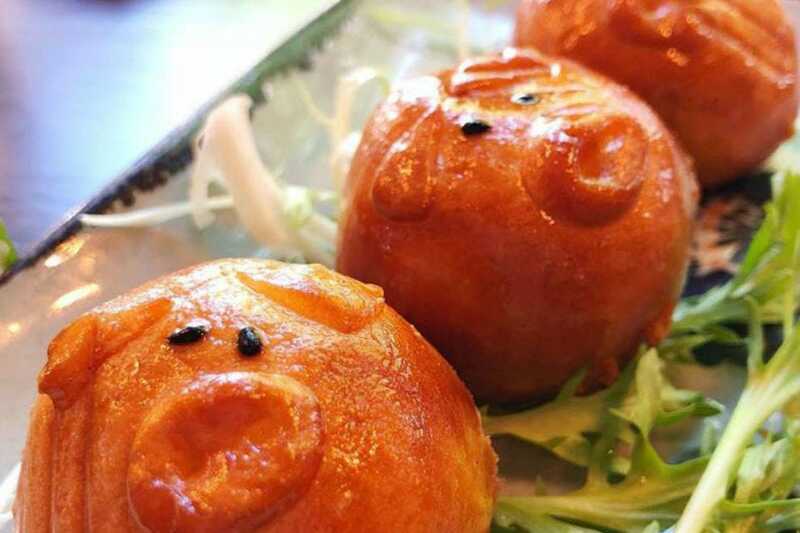 At San Diego's Harumama, "creative steamed buns" are an art form that goes beyond culinary to visual! 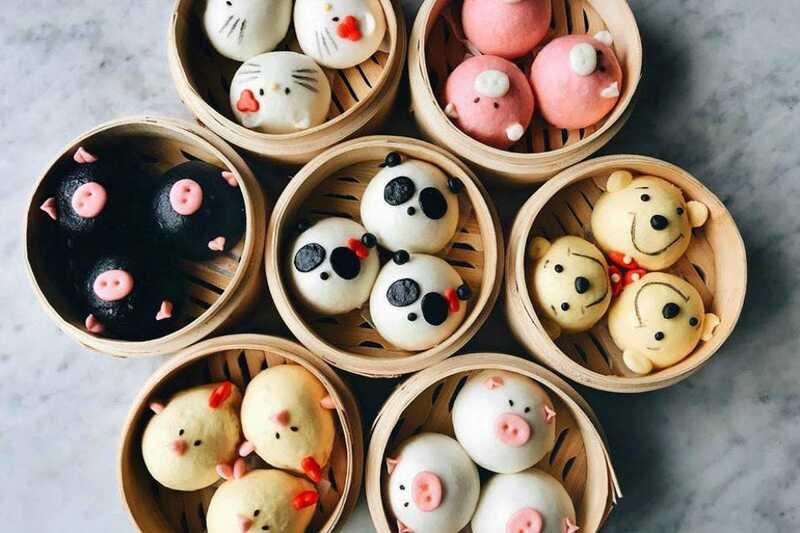 Their characters include panda, chicken, Pooh bear, pig and more – and are almost too cute to eat. Harumama does bao, as well, with options such as eggplant, pulled chicken and spam. Those who love ramen in Denver often cry, "Uncle," but instead of giving up on the search, they're making a statement that they've found what they're looking for. Why? 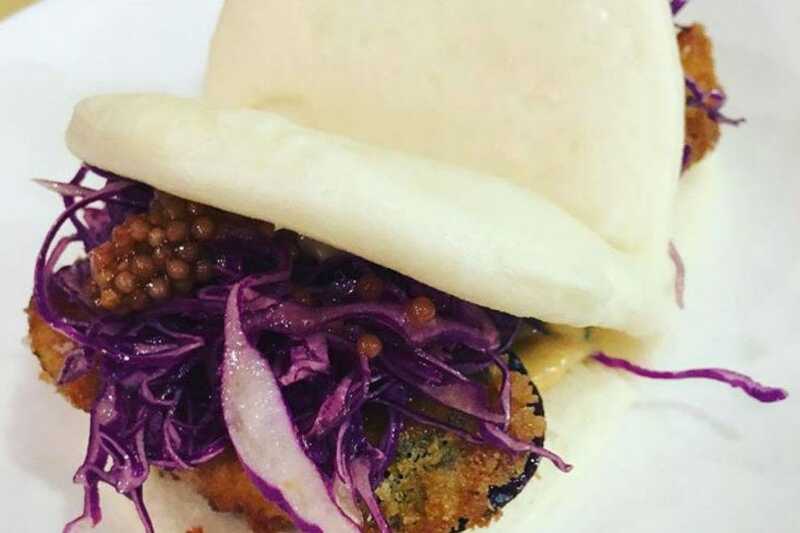 Perhaps the crispy eggplant bun, with its roasted miso mayo, cabbage and ume plum vinaigrette, has something to do with it. 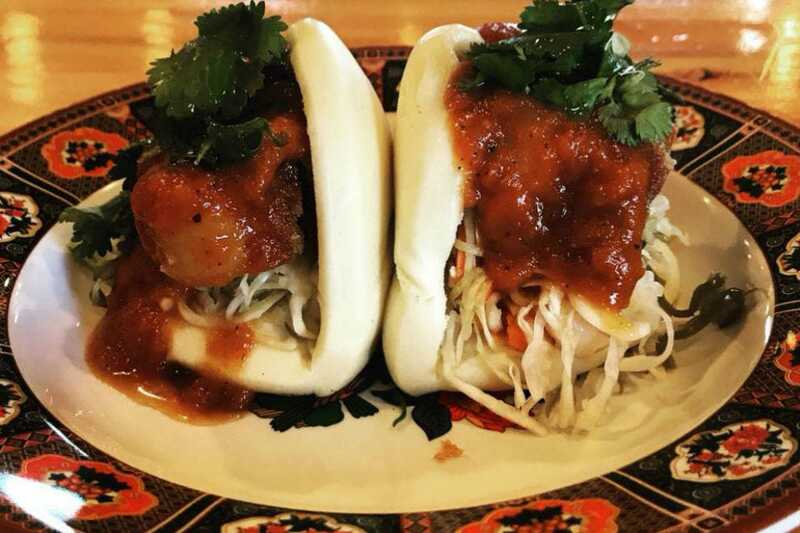 With three locations in the Constitution State (Fairfield, Norwalk, New Haven), Mecha Noodle Bar's menu meanders the Asian realm from Japanese ramen to Vietnamese pho and describes its bao as Asian-American. Options here are a hoisin pork belly, a shrimp roll and crispy KFC (Korean fried chicken). What to do while you're waiting to slurp up your tonkotsu, shoyu, mayu or miso ramen? 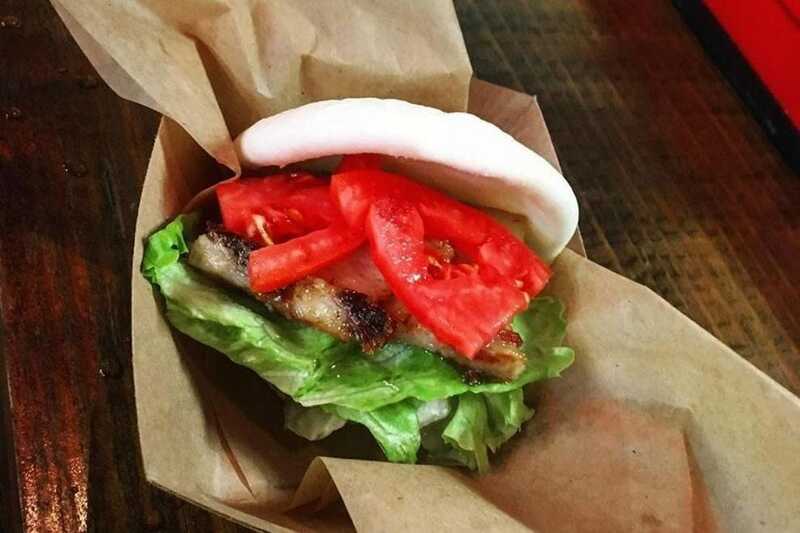 How about a two-serving appetizer of hot Asian buns with slow roasted pork, lettuce, tomato, cucumber, and spicy mayo? Kumamoto gives its patrons bun options of steamy-tender or nice and crispy. 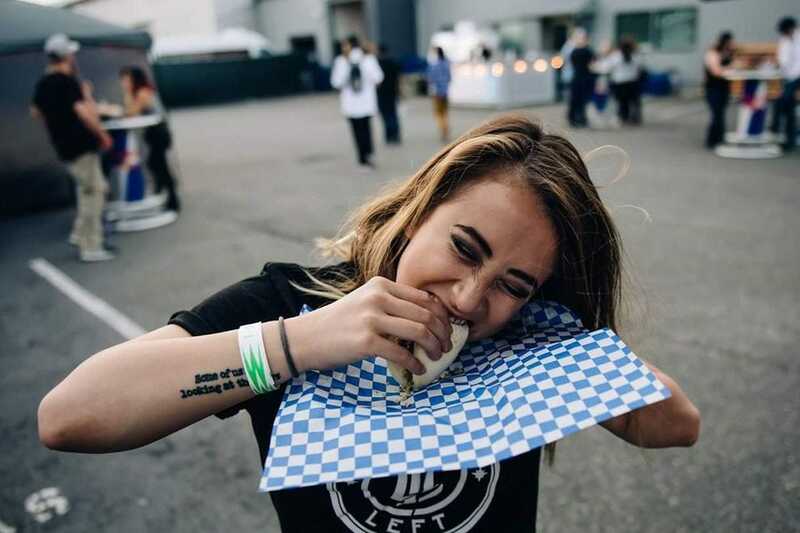 Our nation's capital is a busy place where people eat and run, and so this food truck fills an important niche, making sure they eat tasty, fresh-made fare while they hustle from job to home to Wizards game and beyond. 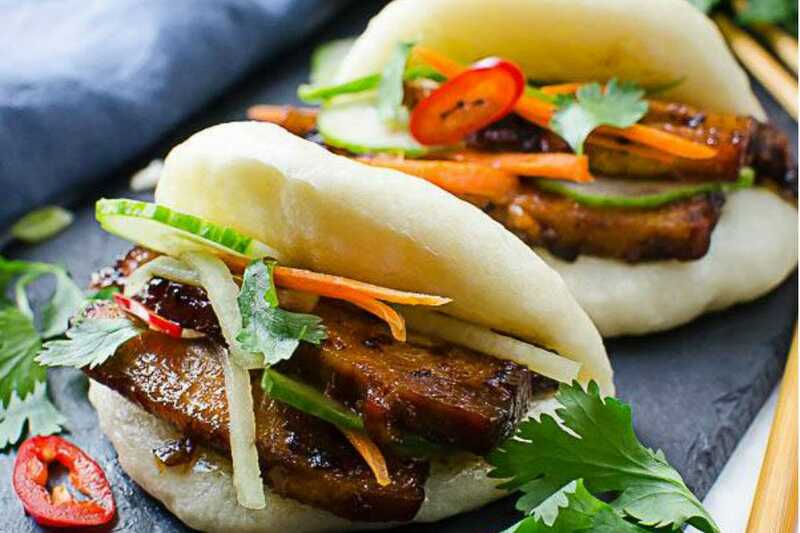 The "hot asian bun" is one option here into which proteins like duck confit and heritage pork can be stuffed. This Orlando truck has given rise to a phrase locals love to impart: "I'm craving Hot Asian Buns!" Indeed, the fare coming out of this four-wheeled kitchen is worthy of such statements with delicious fillings like citrus slow-roasted pork asada and a vegan "chorizo" comprised of quinoa, lentils and tofu. 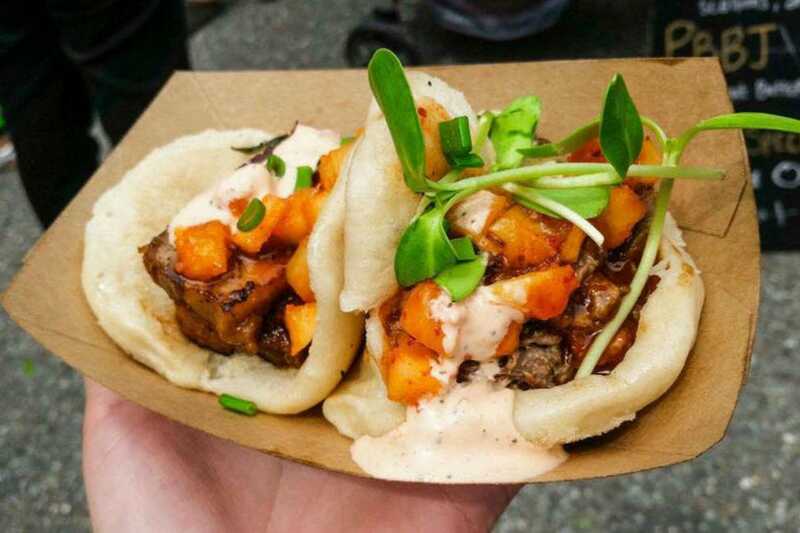 Atlanta's Krog Street Market has been lauded by renowned publications as the city's best food hall and this vendor's pork belly bao (with pickled red onions, pecan sugar and cilantro) was named one of "100 Plates Locals Love" by the Georgia Tourism Bureau. 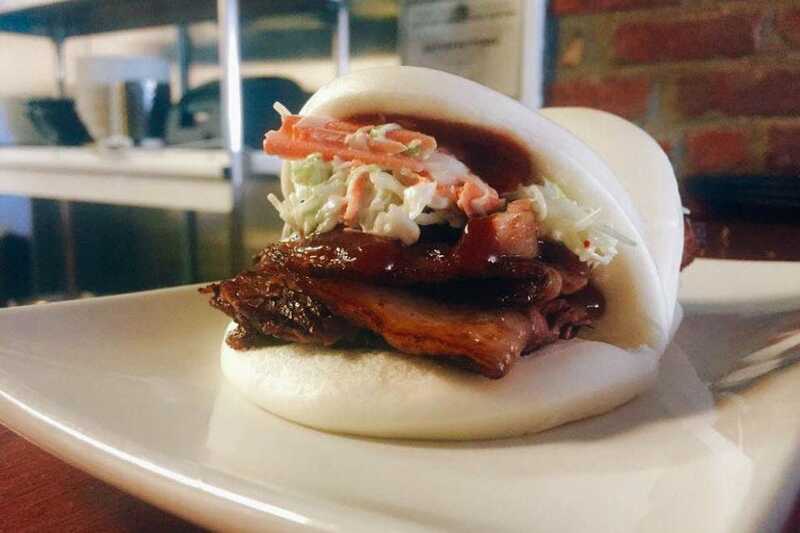 That, and all its other bao offerings, should give you more than enough reason to pop in for a taste. Manapua is Hawaii's pork-stuffed take on the bao. And in beautiful Kailua-Kona, Umekes, with two locations, has spun the dish's evolution back in on itself. 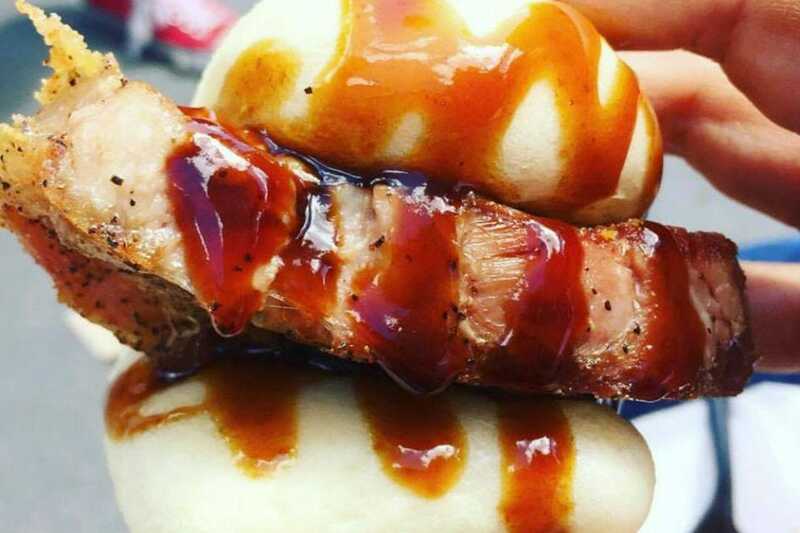 Per its Facebook page, if this local steamed-bun delicacy had a baby with its tacos, the result would be pictured above: Umekes' char siu pork bun tacos. Boise residents have been hitting up Yen Ching for Cantonese since 1986, in part for its dim sum menu. And for many regulars, the 2-fer order of the restaurant's steamed BBQ pork buns sits at the top of their must-order list. 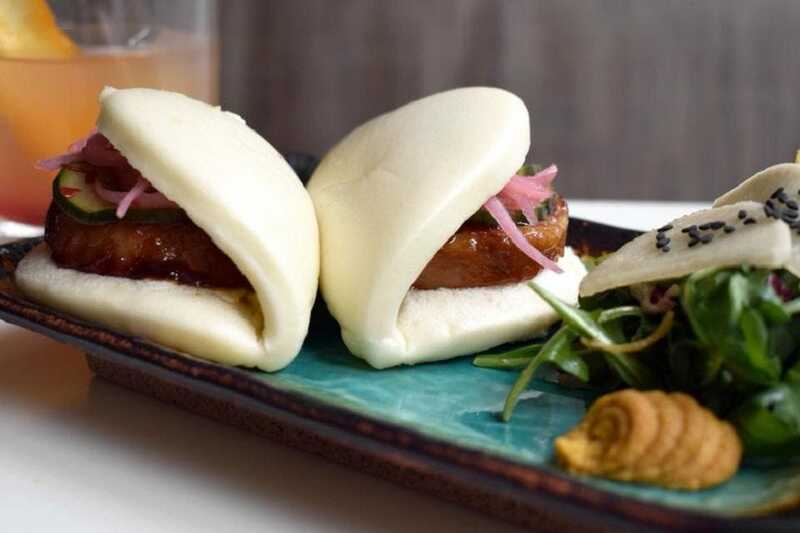 They've got all kinds of gorgeous bao at this Chicago restaurant but you'll only find this adorable piggy variety (with pork, carrots, Shaoxing and dried chili) at brunch, but it's not the only option on the menu. 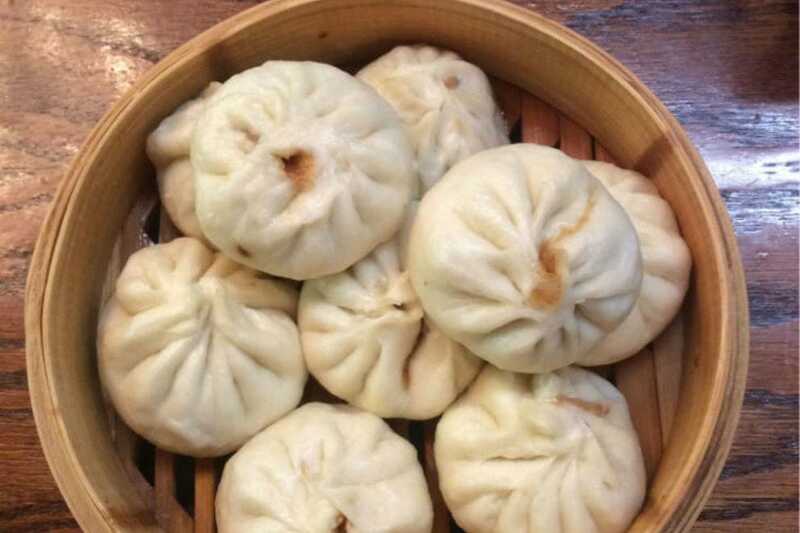 Shengjian bao, char siu and traditional gua bao are available, as well. Indianapolis' Rook classifies its menu as "street food-inspired contemporary Asian," but with creative offerings like the avocado steamed buns with scallion mayo, pickled jalapeno and onion, jalapeno spam steamed buns with pimento "kimcheese" and even a lobster offering, it's likely folks would scarf it down no matter what they called it. This Iowa venue got its start at the local farmer's market and moved to brick-and-mortar in 2017. 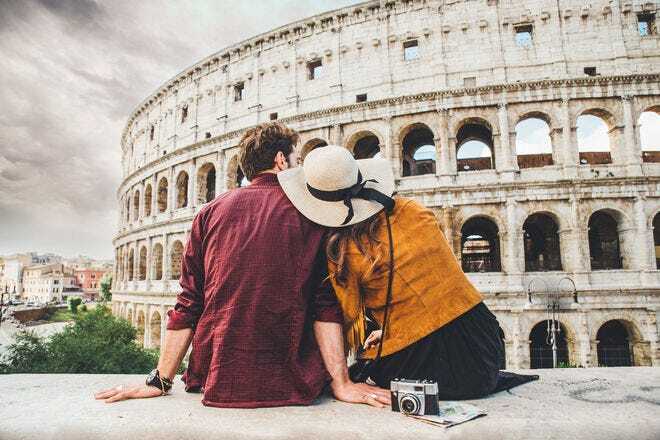 They now have three locations (Iowa City, Cedar Rapids and Des Moines) with fare inspired by this Midwestern couple's travels abroad. 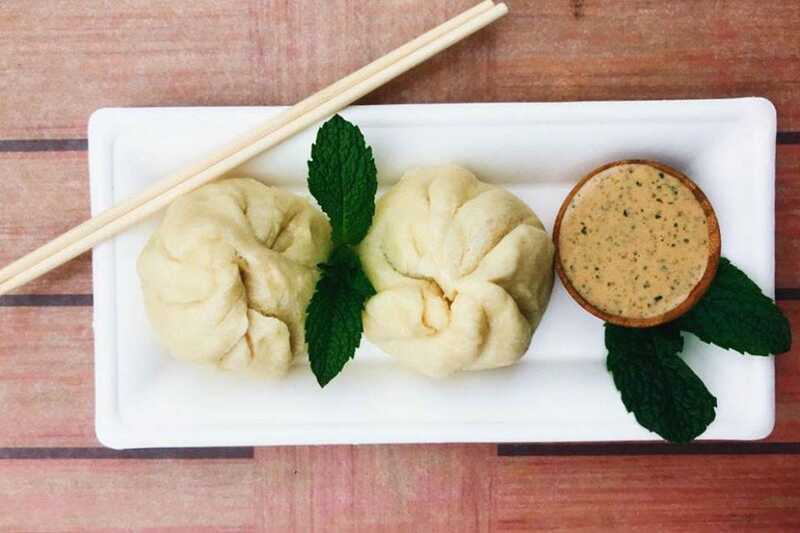 Bao offerings include cashew tempeh, green curry tofu, bulgogi beef and hoisin pork. 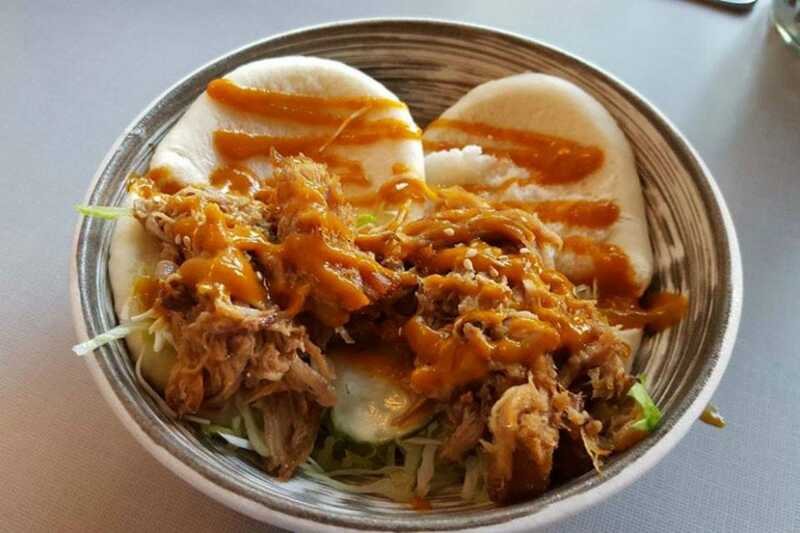 With both food truck and brick-and-mortar options in and around Wichita, Noble House brings the Hawaiian tradition of the plate lunch to the heartland, including kalua pig, huli huli chicken and, of course, fluffy, pork-stuffed manapua. Kentucky - West Main Crafting Co.
You may not always find bao on this Lexington cocktail haven's roster of small plates – the menu changes seasonally – but chances are that when you do, they'll be as well-crafted as what you'll find in your glass. 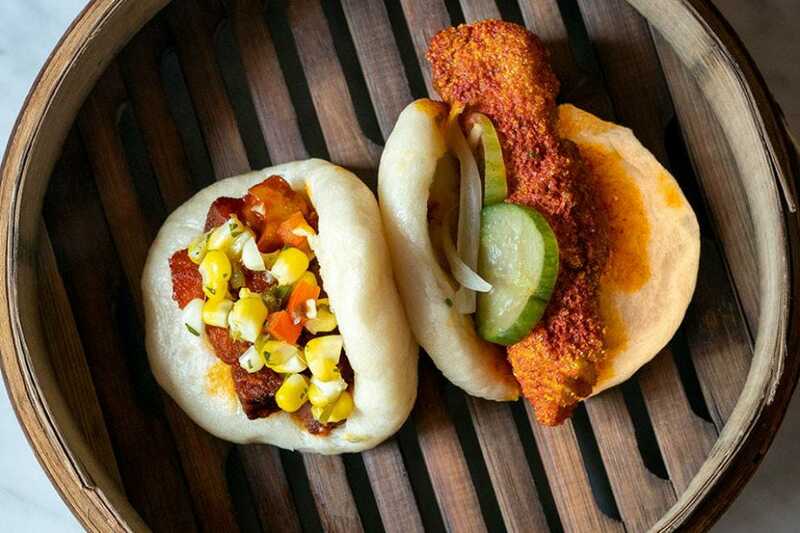 Case in point: the sriracha pork belly bao with sweet corn relish, and fried catfish bao with annatto butter and house pickles. Photo courtesy of West Main Crafting Co.
Uptown New Orleans has something other neighborhoods don't: bacos! 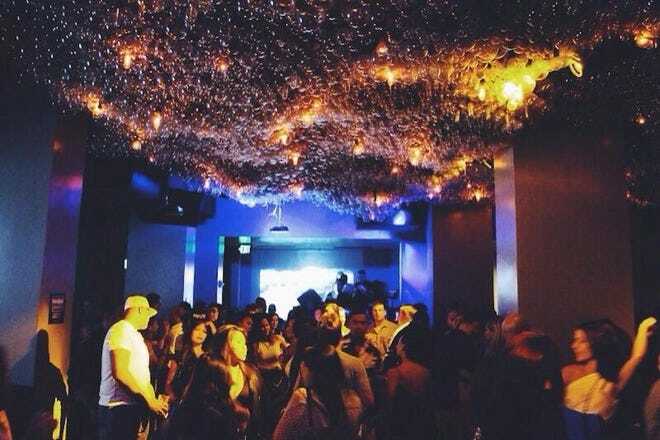 Their version, say the eatery's many, many fans, is on point. And they feature fillings traditionally Asian – and often respectfully Cajun! This lovely thing is the pastrami and bayou gator baco. We kinda need one. Now. 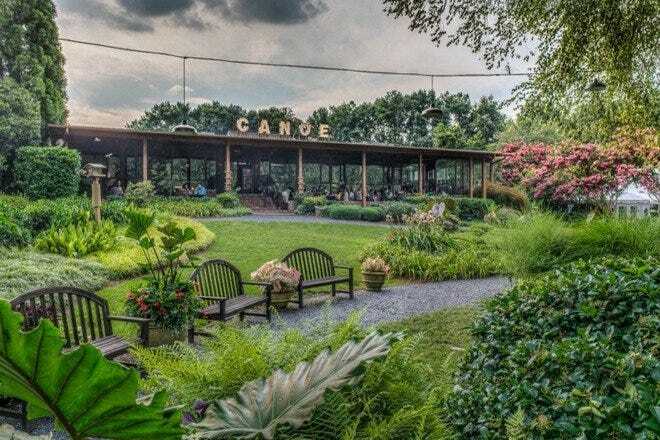 The good people in and around Bethesda will find this purveyor's steamy wares at the local farmers markets – and with both standard and whole wheat buns! Varieties include the expected – pork, tofu, etc – but regulars love their unique fruity kimchi. They've even got a PB&J option for the little ones. In Portland's historic district, the upmarket vibe is a distinctive contrast to the rib-sticking Asian comfort food they sling. Dumplings are a specialty, of course, but special items like this spicy beef curry bun/slider complete with fried fermented mustard greens and creamy Napa wow the palate. They've got steamed buns on their dim sum cart, as well. Just because it's Chinatown doesn't mean you won't find a preponderance of fusion-forward bao options here in Boston. For example, the lamb bao topped with micro shiso, crispy prince mushrooms and fermented tofu aioli. Or how about fried oyster bao? More traditional offerings abound, as well. 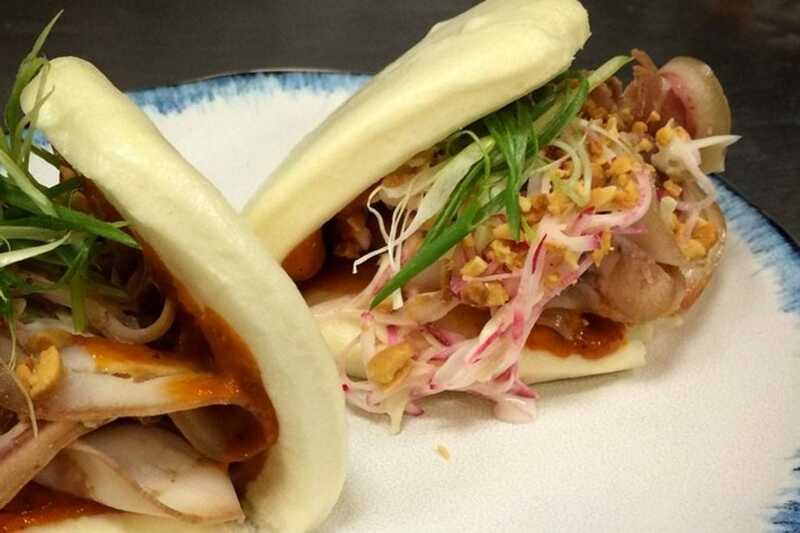 Folks in Ann Arbor can get a deal on bao at this eatery's Happy Hour. Every day, from 4-6 pm, hungry patrons can select two (usually $4 a pop) for just $6. Pork belly, roasted chicken, vegetarian or shrimp tempura. Perhaps you should just grab all four for $12. Dinkytown is a hub of college culture around the University of Minnesota. It's also where you can hook yourself up with poke, rice bowls and a variety of Asian street fare at The Cove, steamed buns included. Options include pork belly, char siu and meatball for a filling and low-cost handheld. 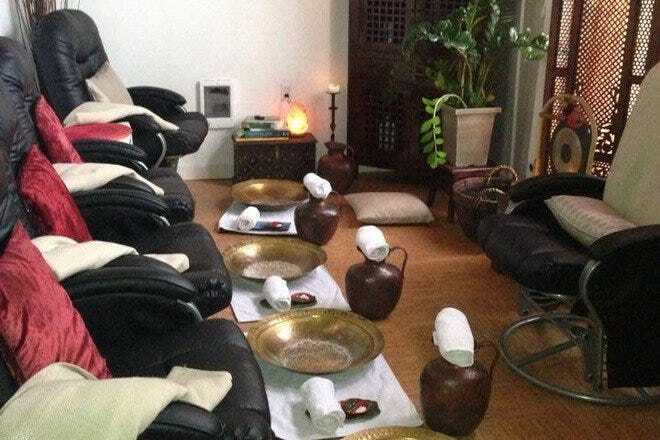 Homemade pork buns are just one item on the vast menu at this Jackson restaurant, but you won't want to fill up because big bowls of aromatic soup (seaweed egg drop? seafood tofu? fish chunk and crab meat?) might be just what the doctor ordered! Want variety in your bao? 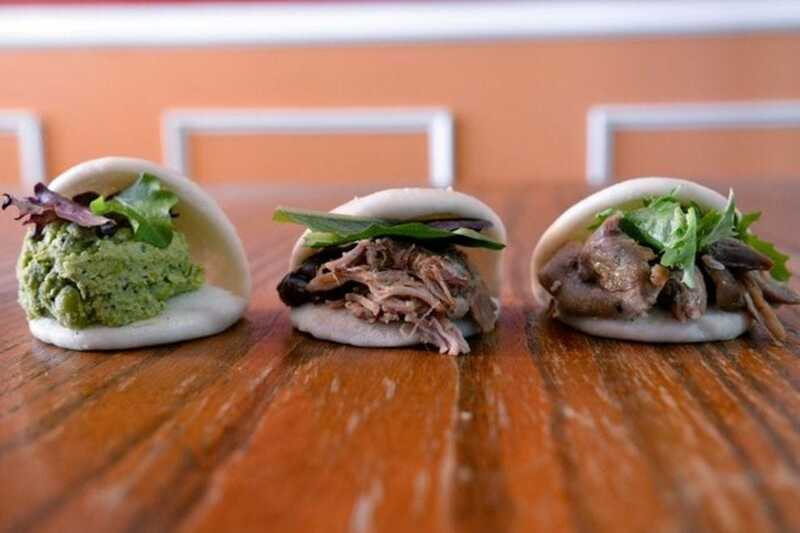 This St. Louis operation offers bao in a vast array of flavors, sizes and even courses. The DIY Butcher's Board includes duck, Taiwanese sausage, accoutrement and buns and serves two. Exotically filled little bao, and even ice cream dessert bao are available, too. Ramen-as-fast-casual has found a home at this Bozeman establishment. It even has a drive-through, because come wintertime, who even wants to get out of the car before they start slurping up the soup's warming, wheaty tendrils? 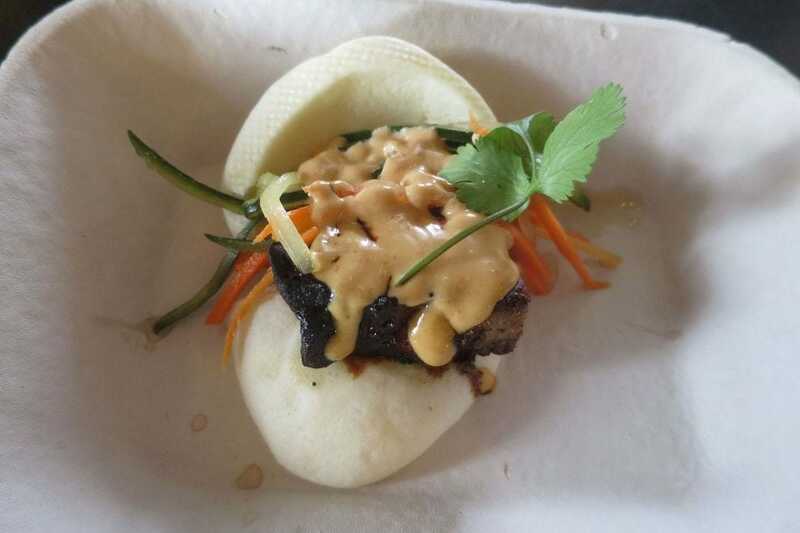 The bonus here: pork belly bao buns with cabbage slaw, pineapple bbq sauce and cilantro. At least you can eat those on the drive home. The Omaha outpost is a carby, meaty haven with a menu that runs the gamut from steam buns to steam-fried buns to potstickers, dumplings, pancakes and more. Its buns? Simple and juicy with several pork, beef, chicken and vegetarian varieties from which to choose. Get lucky at this Mexico-China hybrid at the Cosmopolitan in Las Vegas. 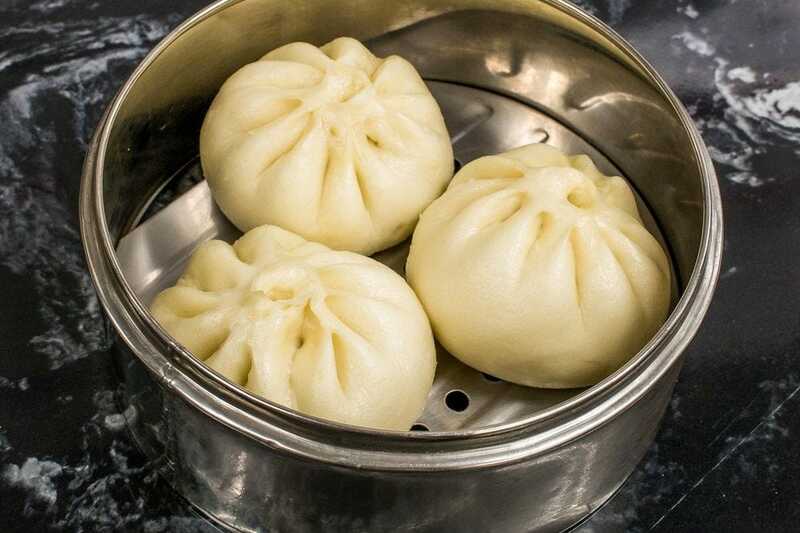 Try the Golden Pigs, fried, delicate steamed buns that are loaded down with Chinese barbecued pork and served with condensed milk, creating a creamy, fatty, sweet/savory amalgam that keep people coming back for more. Vietnamese food for the good people of Manchester is what's coming out of the kitchen here. Steamy bowls of pho feel just right on cold evenings, though one could easily make a meal with appetizers. One such delight is the Vietnamese pork belly marinated with hoisin, pickled vegetables, scallions, cilantro (a chicken sub is available). Doubling down with two locations (Jersey City and Montclair), guests can pair some ramen by the number with a slew of creative , non-soup bites. 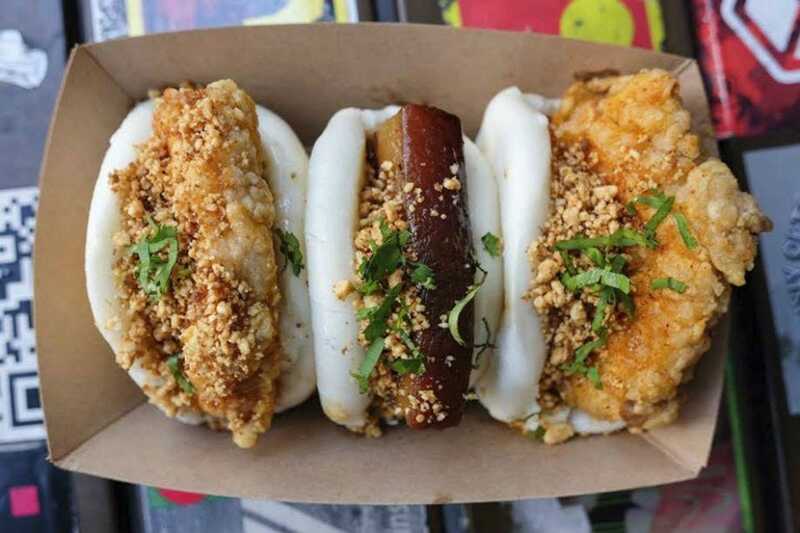 Think buns with fillings like fried tofu, tempura shrimp and pork. Pictured here: braised BBQ brisket with coleslaw from the Jersey City shop. 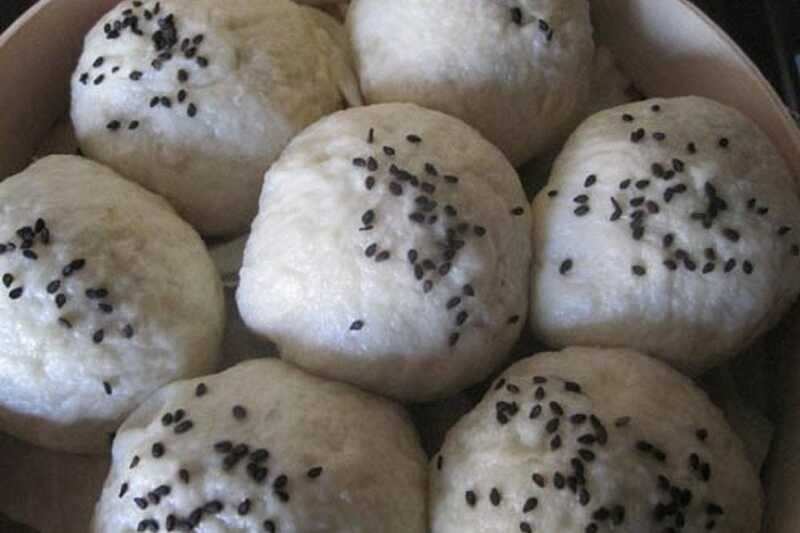 Located at the Talin Market in Albuquerque, this weekends-only dumpling house has a small menu, but a big following. 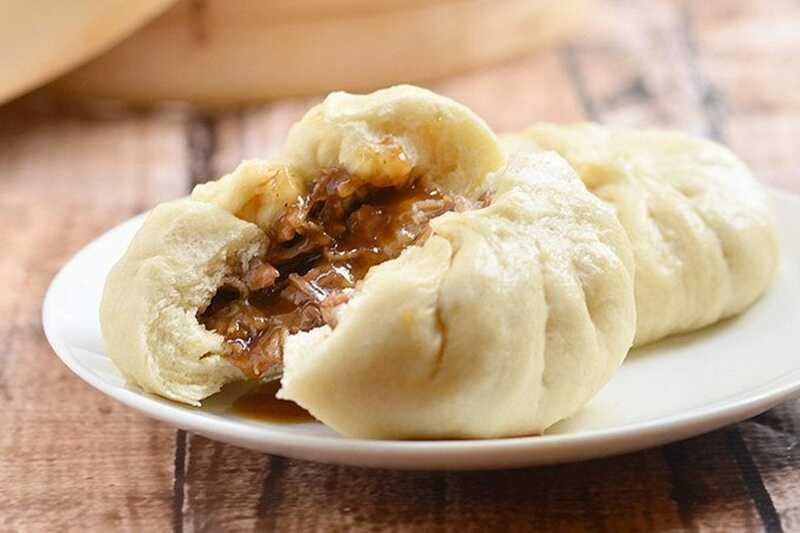 Not surprising when you consider bao stuffed with slow-simmered duck leg and breast that's hand-pulled and lovingly lain atop a crisp slice of apple. That's the Peking duckwich. And we'd like one now, please. 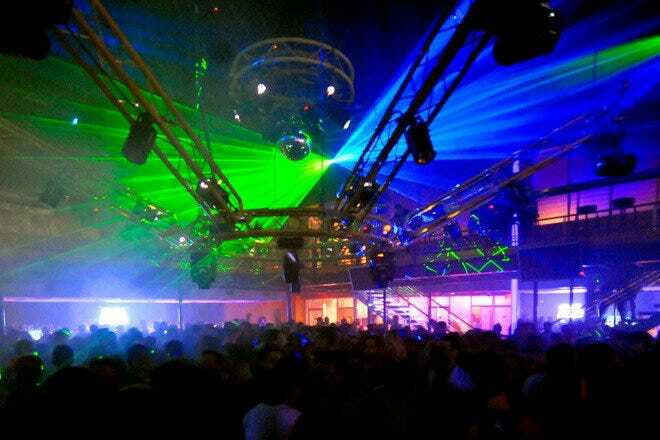 It's a German art school. It's a British goth-rock band. It's an Asian food portmanteau/pun/eatery in New York and the clever names just keep coming. 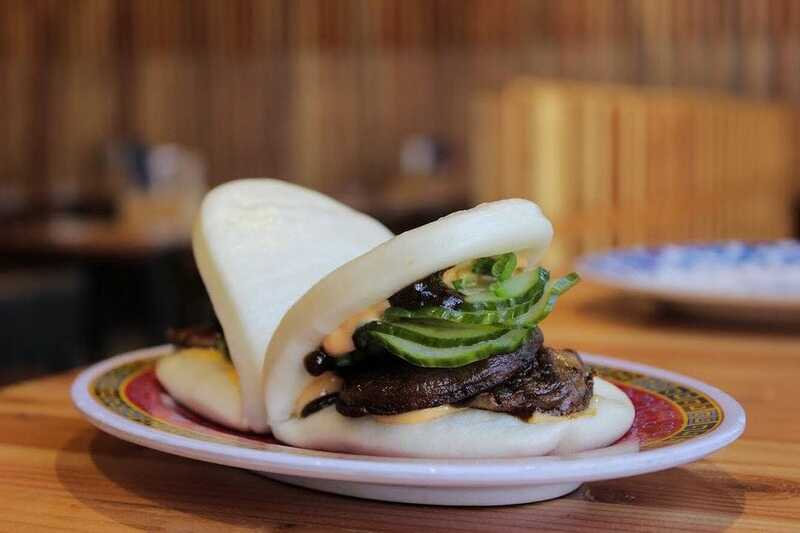 Their Chairman Bao bun features (what else?) "red-cooked" pork braised in a creative amalgam that includes cherry cola. Fatty, sugary, and, say proponents, thoroughly addictive. 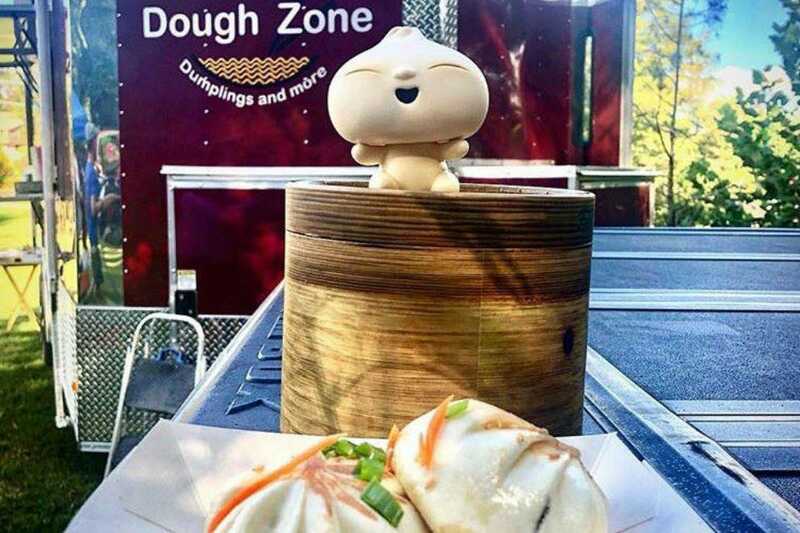 Rolling 'round to the good people of Raleigh-Durham, this mobile purveyor of bao works the region – local stops to festivals, catering, weddings, you name it. On deck: kung pao chicken and crispy pork belly, slow-cooked beef and even a soy BBQ vegan version for the plant-based nosher. Korean, Vietnamese, Japanese, Chinese...Bismarck's Noodlezip brings pan-Asian influence to the Roughrider State. 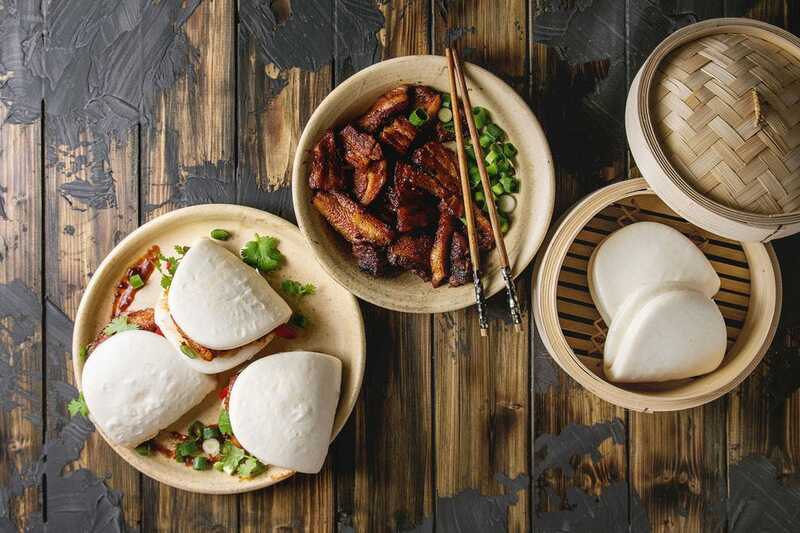 They do so not only via their handmade noodles, but other delights including dumplings, ribs, wings and – you guessed it – tender, hoison-infused pork buns with a nice crisp contrast of slaw. It's contemporary and clean-lined and casual, and Clevelanders have taken notice. 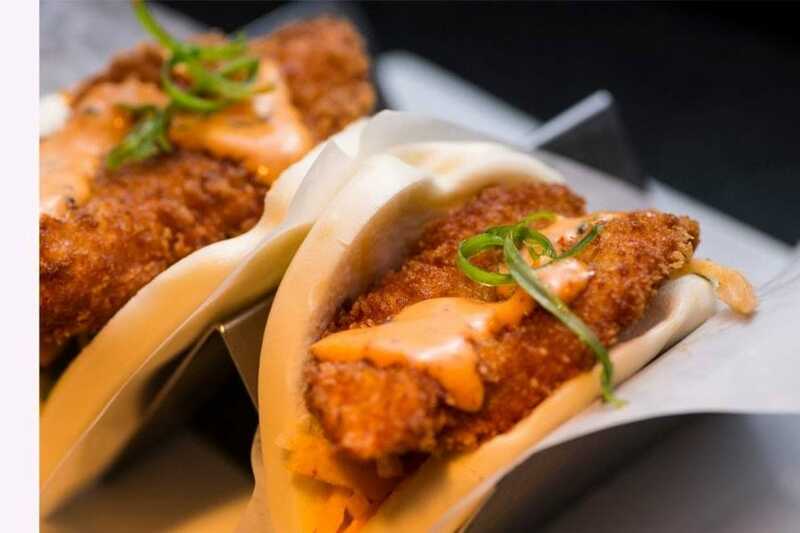 Dumplings and rice bowls and spicy miso ramen notwithstanding, bao fans will find options here – whether fried chicken or tofu or roasted pork or this scrumptious-looking mango pork presentation. It's all about buns and bowls at this Oklahoma City listing. Pictured here is the Philly bun. 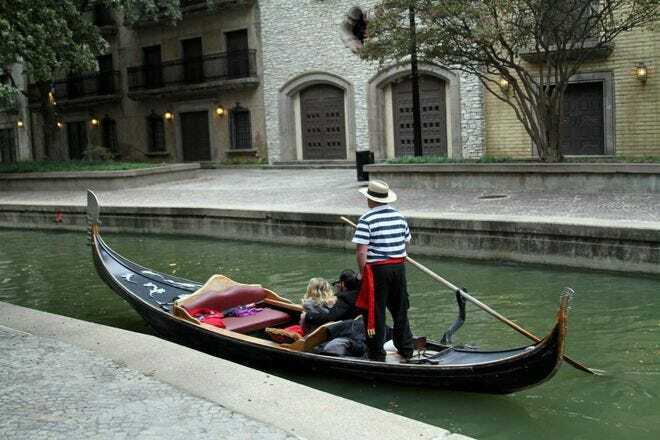 But fans will find everything from soft shell crab to pan-seared duck to other, more "out there" options like the garden (with fried zucchini, mozzarella and tomato ragout). They've even got a s'mores option! 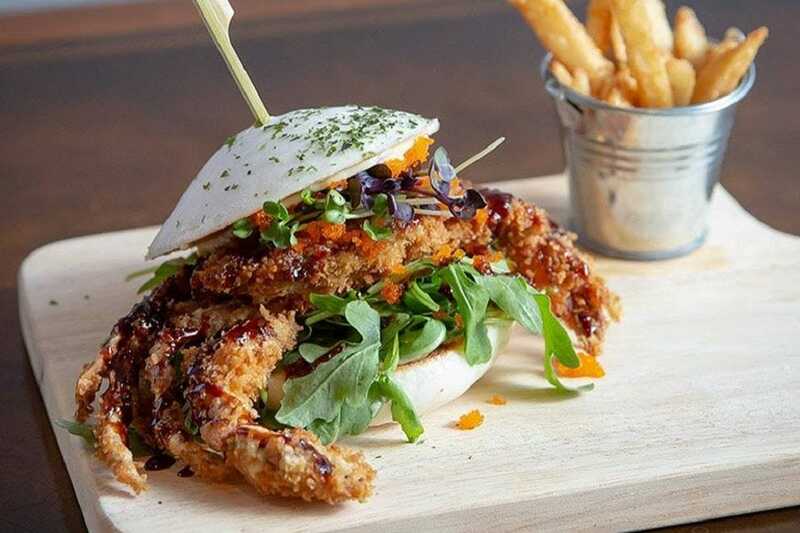 Saucebox has been serving Portland since 1995 with pan-Asian and Pacific Island-style delights, not the least of which are soft shell crab. mushroom katsu and char siu steamed buns. This is the latter, loaded up with braised pork. Pittsburgh is a fine foodie city. 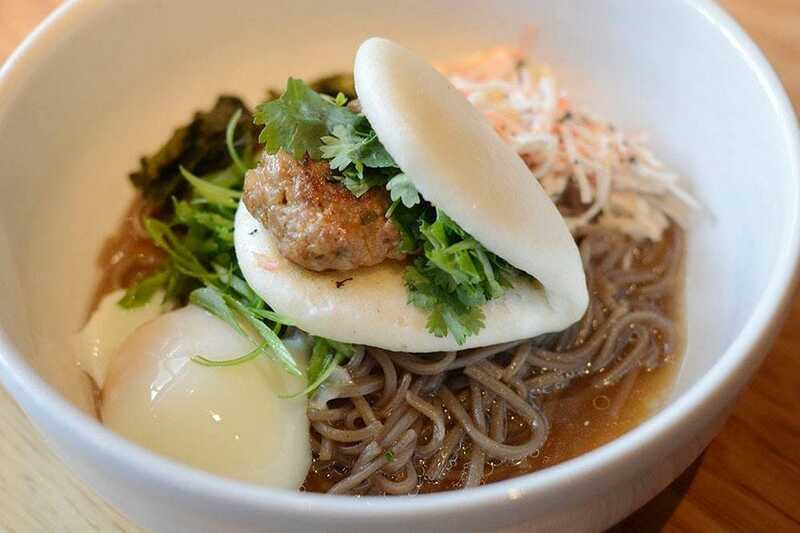 And swanky, beautifully appointed Soba is happy to woo its patrons with pan-Asian delights like the pork and shishito bun, seen here with scallion, crab salad, soft egg, herbs atop steamy, soul-warming noodles. 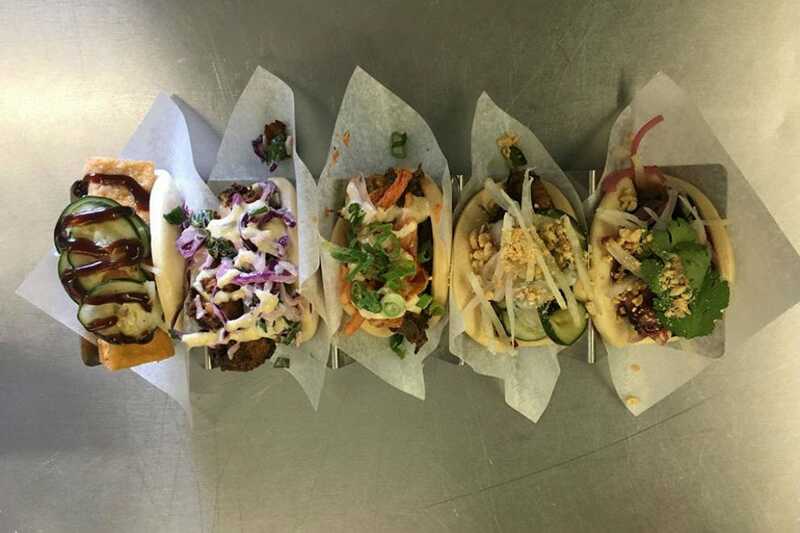 Providence residents know that Asian and Latin fare pair beautifully, which is why they clamor after the Fugo food truck. Fugo, by the way, is an combination of "fusion" and "gourmet." Its bao tell the story nicely with a rotating menu on which one might find Vietnamese pulled pork, chicken teriyaki or miso-glazed tofu. 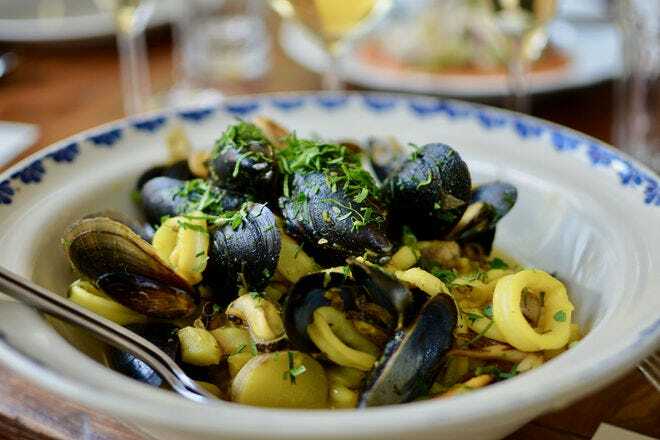 A foodie favorite in Charleston, they've been written up everywhere from Bon Appetit to the New York Times. With standout offerings like the porchetta steamed buns with mala sauce , scarlett turnip, cabbage slaw and peanuts, it's not hard to discern why. 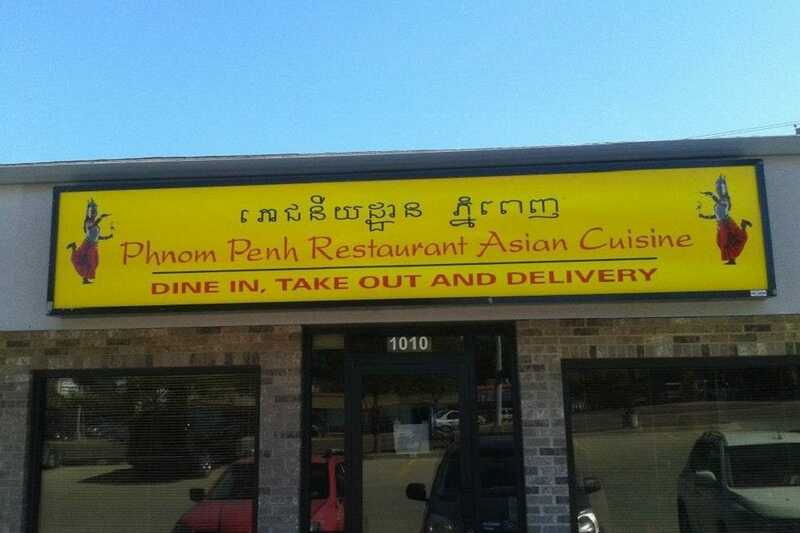 This family-owned restaurant has been fortifying Sioux Falls with Asian offerings discovered in places from Cambodia and Vietnam (where its owner/operators are from) as well as Laos and Thailand. Among the tasty treats, natch, steamed pork buns. Operators of this cleverly named Nashville food truck won't literally kill you, though too many orders of their duck fat tots could end up a contributor. Here, the bun is the star and they stuff it accordingly with tasty and colorful offerings like this PBLT, with cold smoked pork belly and tomato jam. 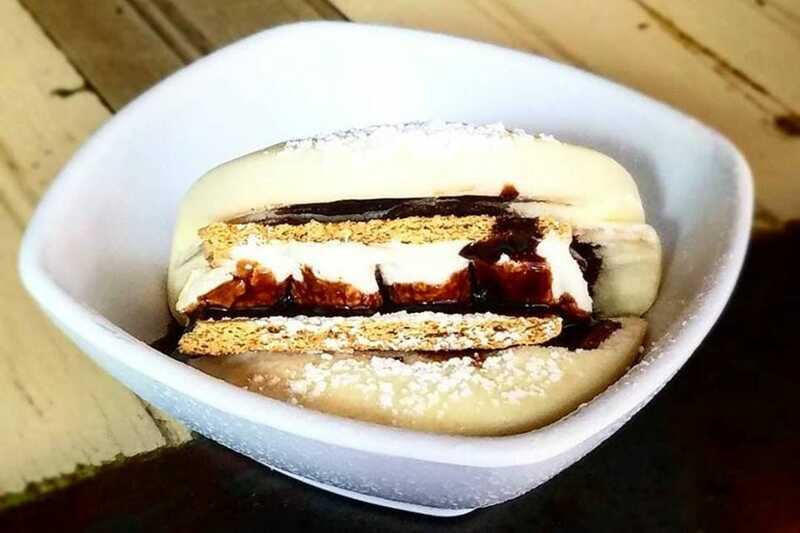 If you think the twice-fried Korean fried chicken and kimchi-cheese empanadas they sling at this Houston venue are decadent, check out this chocolatey dessert bao! 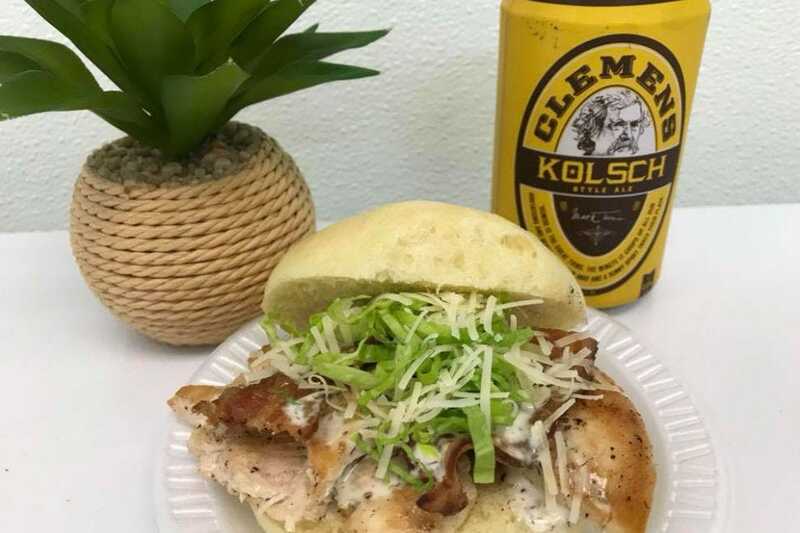 Fans of the savory can opt instead for carnitas, spicy chicken and K-Philly options – or maybe try both. A locally lauded gem hidden inside the Ocean Mart in the town of Roy, Mama's Kitchen is where you go when shopping for Korean, Japanese, Filipino, Chinese, Thai, Vietnamese, and other Asian food provisions and you find yourself famished. 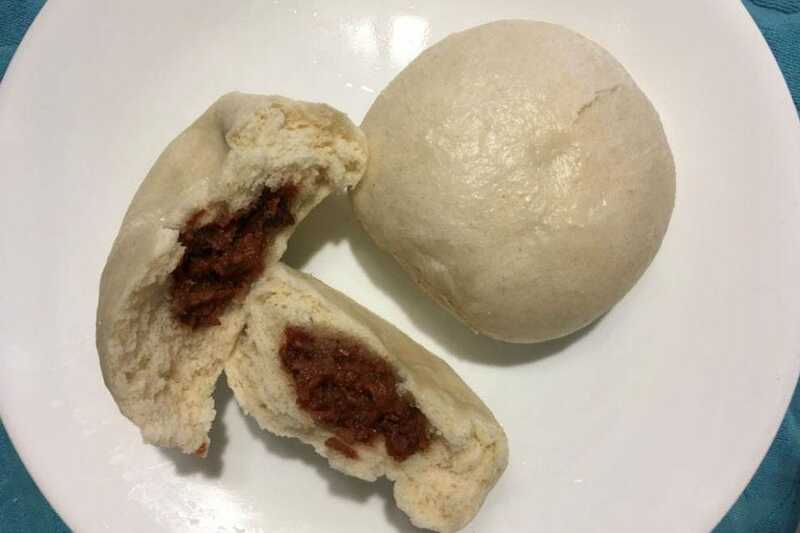 This is their siopao, the Filipino version of the steamed pork bun. If you're ever in Brattleboro and find yourself craving the delights of a dim sum cart, you can drop in here. 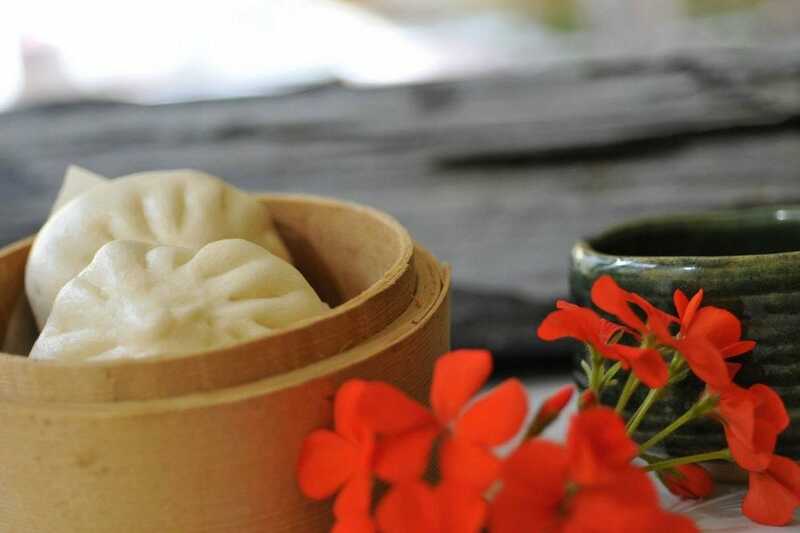 Find fare that includes steamed sweet bean paste buns or an even "veggier" offering pictured here, jammed with kale, turnip greens, tofu and flax seed. 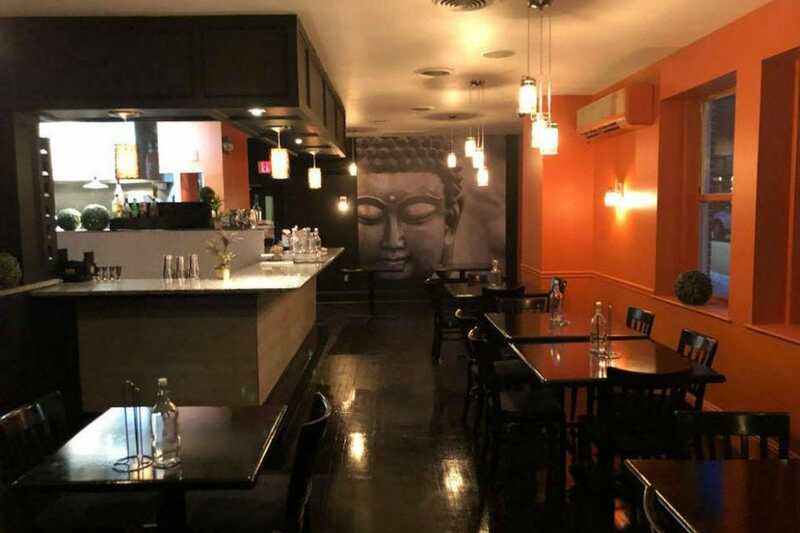 When trendy Tysons Corner craves contemporary Asian, this place – it's original location was a downtown D.C. favorite – is likely among the venues they'd consider. 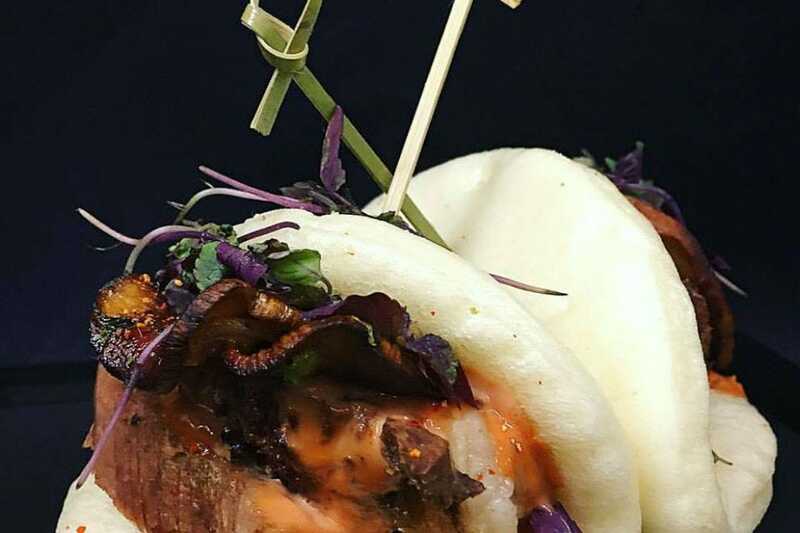 Among the lures on its lauded $5 happy hour menu: buns filled with Korean BBQ brisket, shiitake mushroom and scallion, panko tempura shrimp and pork belly. 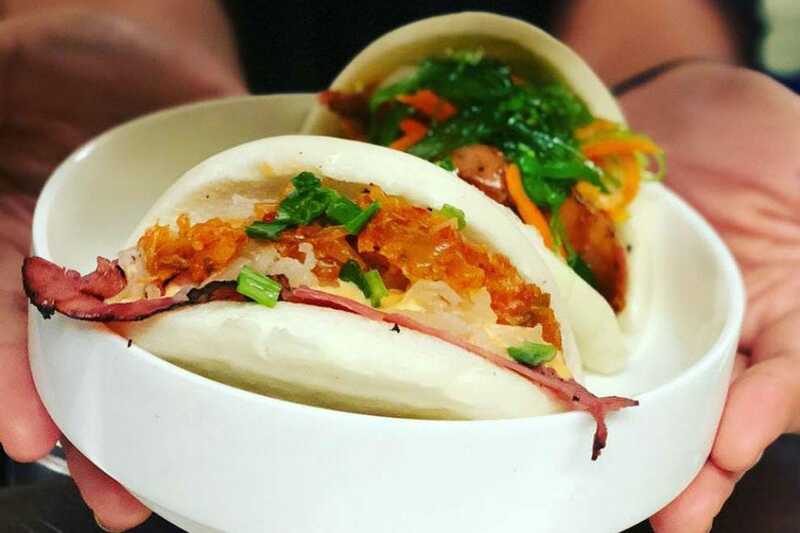 Another food truck, another cute name, this time serving Seattle and the surrounding area with its tribute to the traditions of the Taiwanese night market. 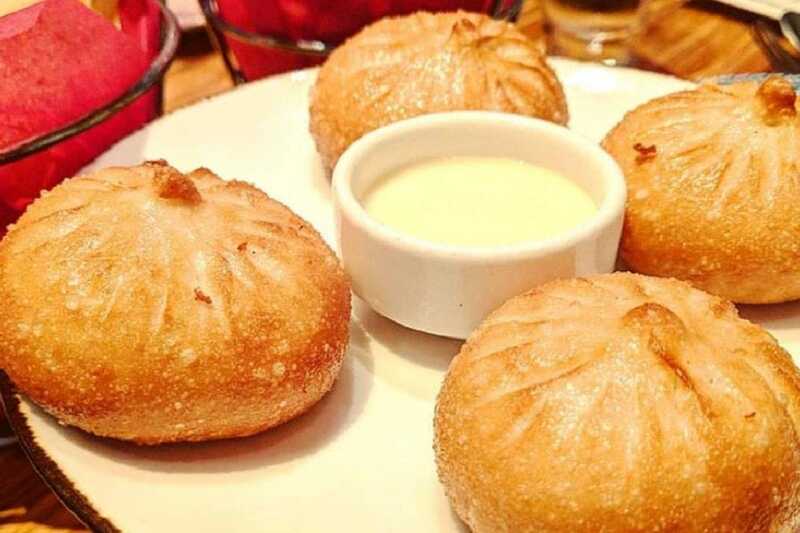 Our personal favorite on the menu: the Pig LeBAOski. Not because we have to taste its amalgam of braised pork belly and pickled mustard green relish. It's totally the name. But seriously, that does sound good. 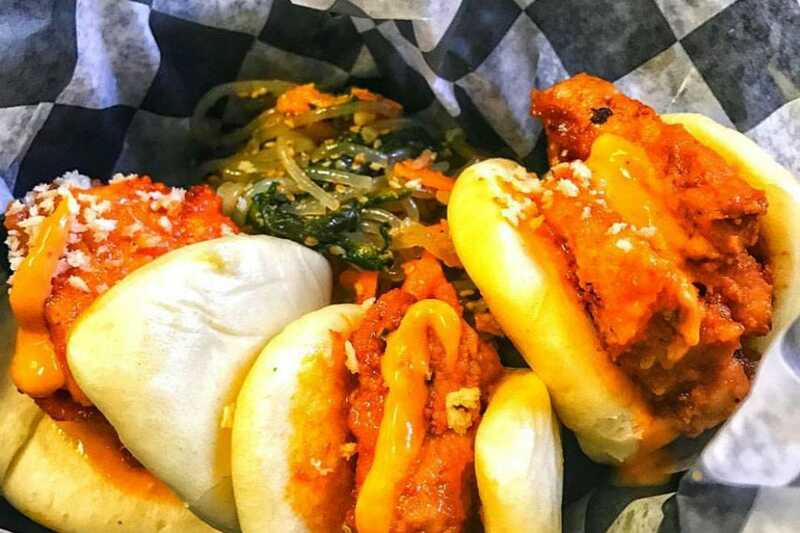 It's where folks in Sheperdstown get their bubble tea on, but its menu also includes Korean faves like japchae, Asian street tacos and, yes, bao – like the spicy pork pictured here. It's got a nice tempura crunch! 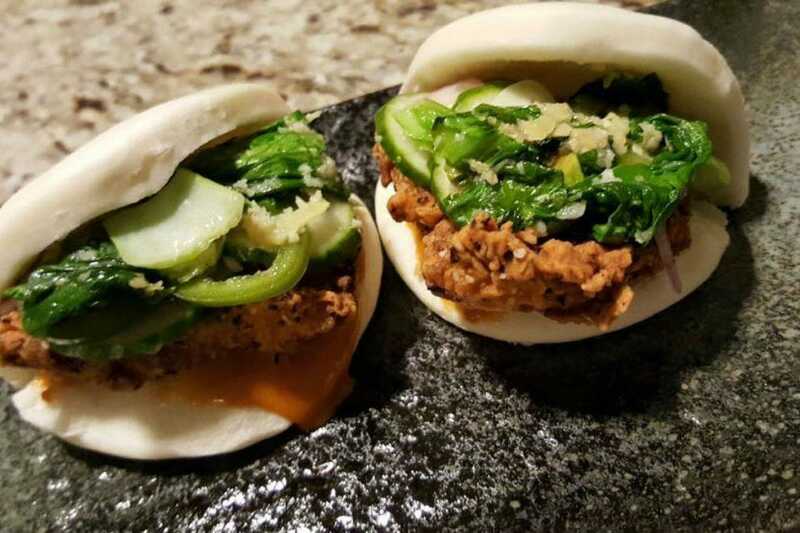 It's a popular spot to slurp in Madison, but they've also got a nice array of bao, including Korean bulgogi, tofu and spicy pulled pork, but they like to experiment, too. 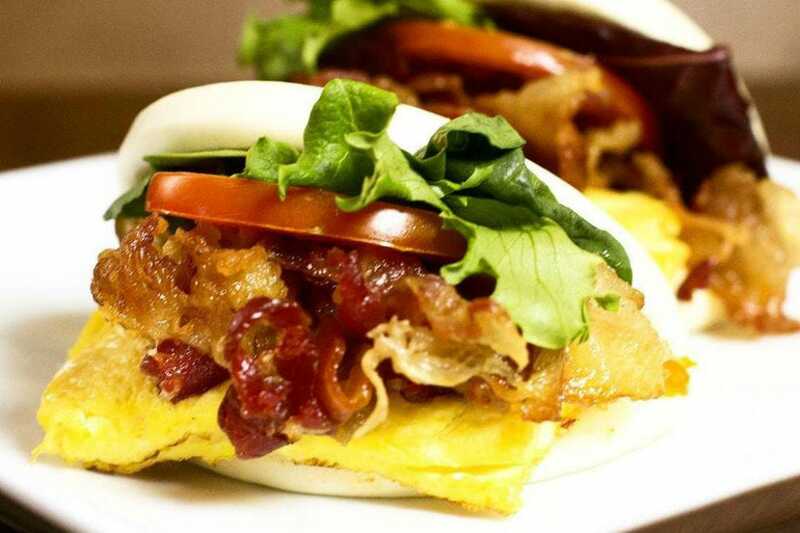 For example, the brunch menu's BELT bao, featuring bacon, egg, lettuce and tomato. Breakfast, take a bao! 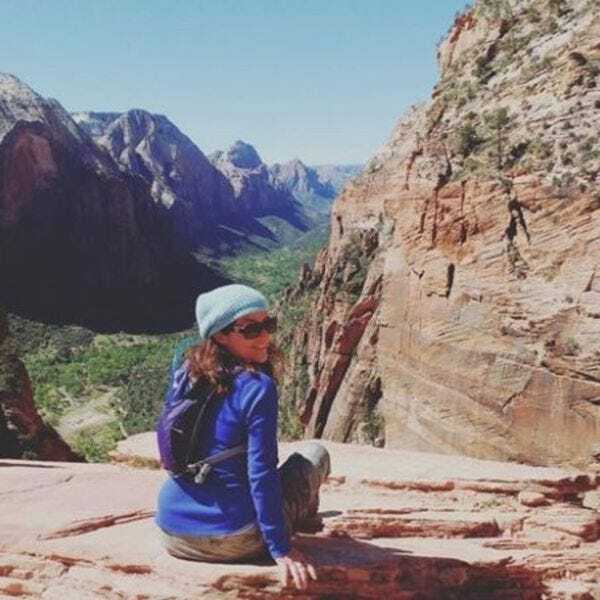 Jackson Hole sees a lot of tourists and, as such, has enjoyed a nice restaurant-scene evolution that's even extended beyond. 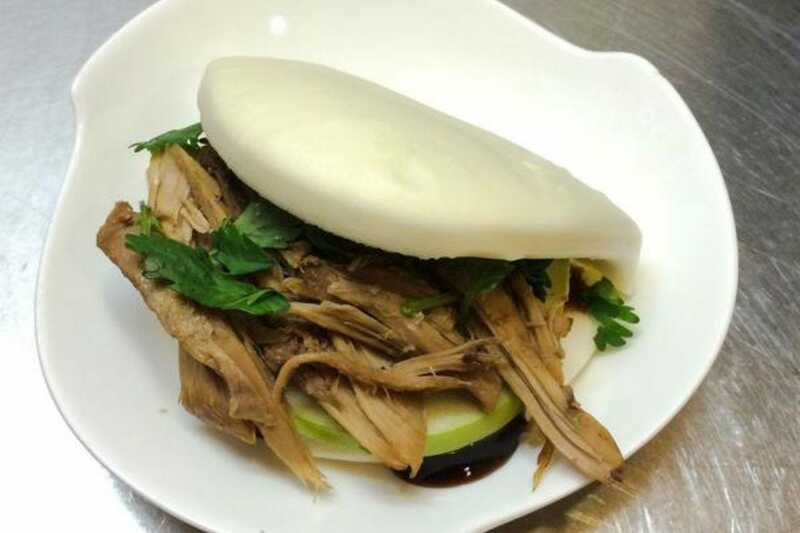 Bodega was transformed from a gas station into an upmarket grocery with a wine shop, a bar and a dining venue, at which you can score delicious steamed pork buns like this one!